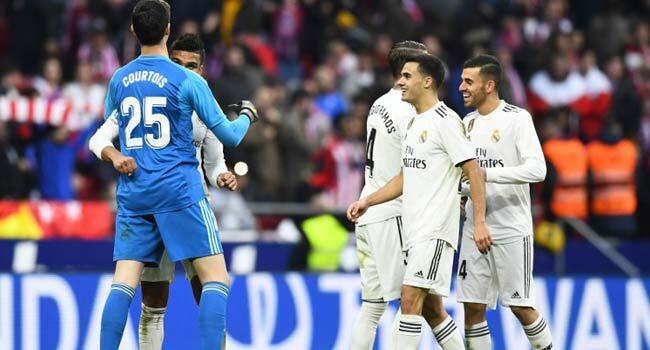 Thibaut Courtois overcame the jeers — and a barrage of toy rats — while Gareth Bale delivered a timely reminder of his talents as Real Madrid beat Atletico Madrid 3-1 in a feisty city derby on Saturday. Real’s fifth league win in a row means they sit second for the first time since September, above Atletico, and just five points behind Barcelona. Barca could restore the gap to eight by overcoming Athletic Bilbao on Sunday but another impressive performance at the Wanda Metropolitano, aided by some fortunate decisions, puts Real back in the thick of the title race. Bale had been left out of the starting line-up for the second time in four days, after he was also a substitute against the Catalans in the Copa del Rey on Wednesday. 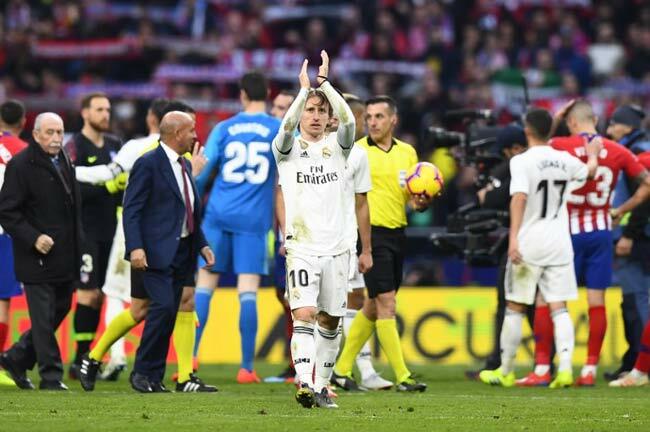 The Welshman’s goal, his 100th for Real Madrid, was not lost on Solari, even if his celebration raised eyebrows, after he appeared to make an insulting gesture towards the Atletico fans. 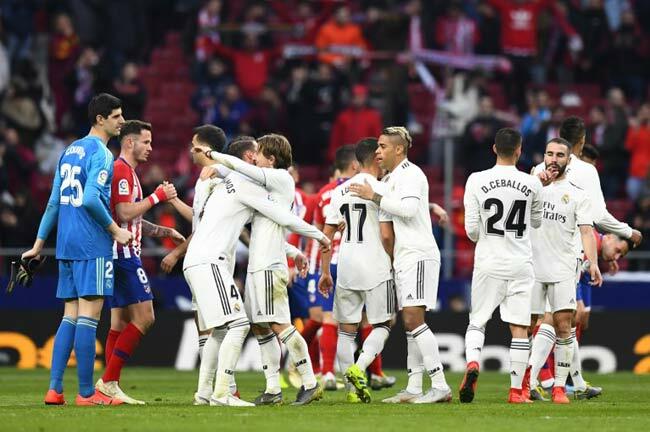 Bale’s finish ended their hopes of a comeback after Sergio Ramos’ penalty put Real in front at half-time, with Antoine Griezmann earlier cancelling out Casemiro’s acrobatic opener. 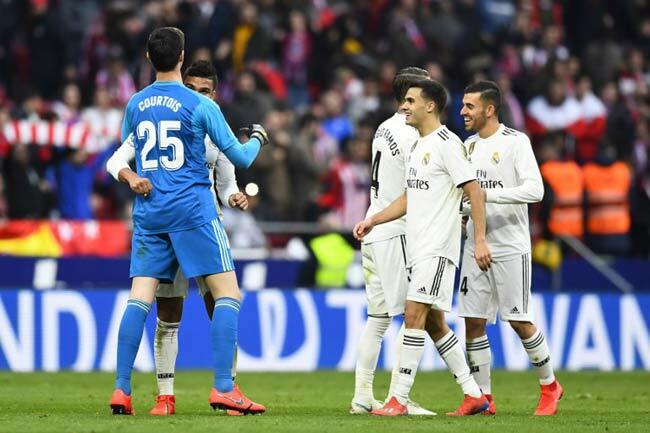 By the time Thomas Partey was sent off with 10 minutes left, the game was up, and Courtois could have been forgiven for breathing a sigh of relief at the final whistle. The Belgian, who spent three years at Atletico, was playing in the white of Real for the first time at the home of his former club. He was whistled when he came out to warm-up and then before kick-off too, as the Atletico ultras behind the goal hurled dozens of toy rats towards his head. A sign read, ‘Thibaut – Rata’, just to underline the point. Alvaro Morata had gone the opposite way, also via Chelsea, now for Atleti after starting out at Real Madrid. He was cheered and, despite a quiet game, would have scored but for VAR ruling out an impressive lob in the second half. Real survived an early onslaught and, with virtually their first attack, scored. Ramos rose high at a corner and the ball was flicked to the back post where the unmarked Casemiro threw himself into the air, and bicycle kicked in from six yards. Atleti were still snarling as Karim Benzema was shoved into the hoardings and Sergio Reguilon tumbled into the cameras. Jose Gimenez clashed with Vinicius Junior, a scuffle that would resurface again soon after. First, though, Griezmann equalised, sent through by Angel Correa, who was fortunate not to be penalised for a robust challenge on Vinicius. Griezmann, just onside, poked the ball through Courtois’ legs. Vinicius’ pace had been a constant thorn in Atleti’s side but Gimenez refused to be beaten, diving in from behind when he had little chance of getting the ball. The foul might have been outside the box but VAR disagreed and Ramos whipped the penalty into the corner. Morata had barely featured in the first half but he was celebrating a goal early in the second, only for his superb lob over Courtois to be ruled out by VAR for offside. Bale came on for Vinicius but Atletico were on top and again, felt aggrieved, after Morata fell over a clumsy Casemiro challenge in the box but referee Estrada Fernandez was unmoved. The push subsided and Bale delivered the final sucker-punch. Benzema made the space and Modric the pass but Bale had a lot to do from the angle on the left. His driven shot flashed across Jan Oblak and nestled in the bottom corner. Atletico’s misery was compounded late on as Thomas earned a second yellow for a nasty challenge on Toni Kroos and Bale could have added a fourth but headed over.